I would not purchase again. I bought 2 of them and within 4 months they started crumbling. They are not weather resistant. I love this stone recently lost my grandson so next spring going to make a memorial garden and this one will be one of the best in it Thanks so much !! I have bought so many of these plaques and given them to people. That should speak for itself. I ordered this for my Parent's Memorial Garden. It is beautiful, heavy but not too heavy. Very please with my purchase. I have ordered 3 of these for family members and it is of very good quality and looks better than the one on line. I will order again! This memorial stone is very nice, the verse is so lovely & true as if it were straight from my heart. Being able to personalize it makes it that much more special. I definetely would buy this product again. The product is a beautiful memorial of those we've loved and lost. 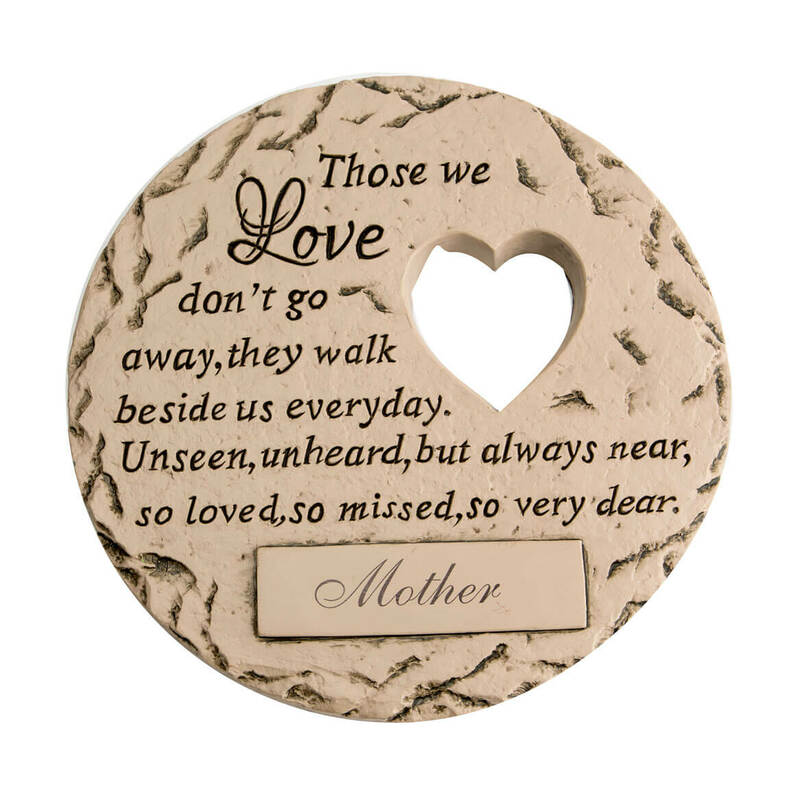 I have bought a number of these and given to friends who've lost their loved ones. I have one for myself as well. It's a touching tribute to give to someone. 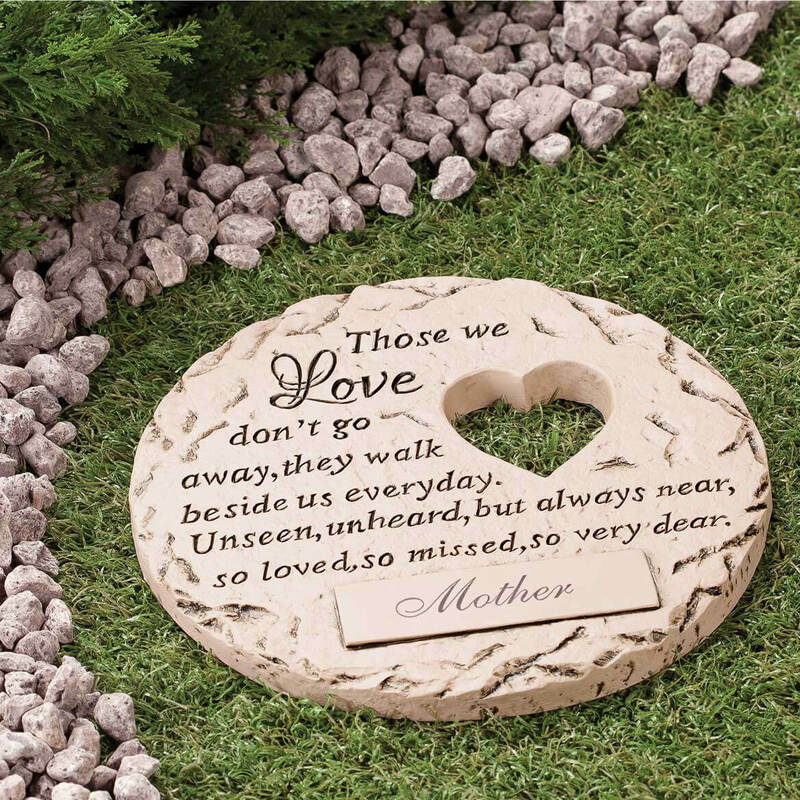 I purchased this to add to a `memorial for our eldest son that I've established in our yard. Since it is outside in our rainy Washington weather I wasn't sure how the printing would stand up so I sprayed the front and back with a urethane paint. Hopefully that will help the finish remain crisp and the printing will remain legible. I ordered the memorial stone quite a while ago. After I put the order in I was told it wasn't available at the time. I finally received it last week. It was worth the wait. I love it. I will be putting on my husband's grave..
Bought this in memory of my wife who passed away in April 2017. Keep it in front of the memorial I have for her inside of the apartment. Very nicel to remember her by. The stone I ordered is lovely. My only issue is how long it took to receive. I understand that it was backordered but it took my contacting them several times before I was told about the backorder. Had I received an email telling me about the backorder I would have understood. I bought one last year for a memorial to keep and it was very nice and had a need for another one. Beautiful words for loved ones loss! And great quality! I recently lost my husband and in the Spring will plant a tree in remenberence of him and I thought the stone would be a nice touch. Thought about a person that’s been gone a long time. It is very sentimental and true of those we love. I have lost some one I love and need closure. These items will help do that. Love the verse n saying on this stone. perfect for my cat as a memorial stone. I received one after the loss of my spouse and It really helped so I thought I would buy one for a friend who just lost their loved one. 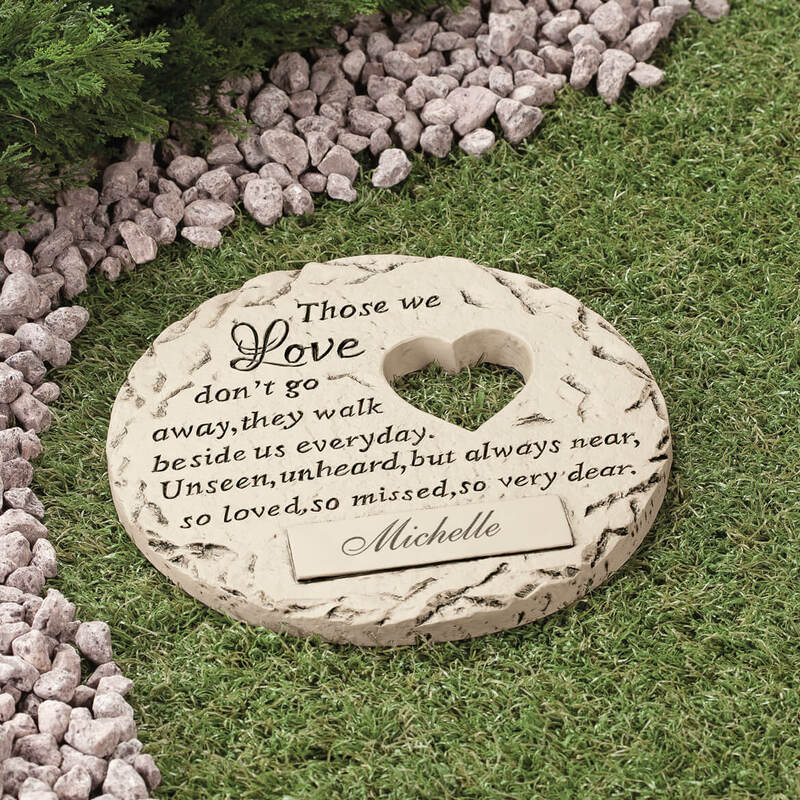 looking for a way to note the grave of a very beloved family pet and this was perfect without, spending a huge amount of money. Thank you so much! My family has been looking for something like this to put on our Mother's grave site. This is lovely. My mom just passed away. My dad's been gone 4 years now. You don't find there names on anything. When I seen this, I just had to have this one. Reminds me of my son. A dear friend's - husband died. He loved to garden. I also bought three others. One for me and two more for friends whose husband's have passed. Because I can't stop missing my papa and this will remind me in some way, he's still with me. I love the sentiment. Perfect for my dear friend. I also ordered 2 for her 2 sons. We are all planting roses in our yards in honor of Sharon, so this stone is perfect. My Daughter has A Memorial Table for her Daughter and we thought this would be a nice addition. I purchased this stone when my husband died, so I thought my friend would like it when her husband passed away. Mother passed away a couple years ago. I have a memorial garden and wanted to add this item. plus now my mother's who I think of all of the time. I love the sentiment and this is more unique than other stones I have looked at. Last year lost my Mom and Brother in law. Dads been gone since 92. Their buried so far from us. We have a beautiful garden and just loved these to put in our garden. Just brings us closer to them. Thank you! There Beautiful. Bought one last month for my dog that passed in 2014 and loved it. It's in our garden as well. My brother has passed. It touched my heart. There's so little you can do. The verse says it all. I've ordered six of these and those whom I have given them to love them. We alway place something personal at the cemetery in memory of our two sons. THOUGHT MESSAGE CONVEYED WHAT PERSON IS THINKING ABOUT HER BELOVED DOG OF MANY YEARS. I thought it very appropriate for my best friend, her mother passed away in October, but she feels like her mother is with her every where she goes. Beautiful stone for the loss of a loved one . I bought an additional one for a funeral I was going to. As a memorial to a beloved family member that I will always see in my back yard. What are dimensions of stone? BEST ANSWER: Thank you for your question. It is 10"dia. We hope this information will be of help to you. Is the "NAME" stamped on or engraved like the rest of the stone? BEST ANSWER: Thank you for your question. We use a UV printer, which stamps the name on it in ink. We hope this information will be of help to you.